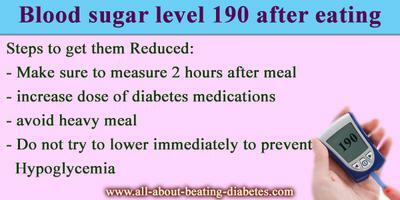 My blood sugar level after eating is 190. What can I do to lower the level immediately? It is normal for blood sugar to get raised after eating. If you measured your blood glucose less than 2 hours after eating, then, I'd suggest to wait until 2-3 hours after eating to repeat the testing. If you are on diabetes drug, you can take them as prescribed by your doctor. It is not advised to lower high blood sugar immediately as it might cause severe hypoglycemia associated with other severe problems. 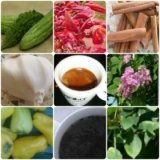 I advise to keep following the healthy lifestyle and diet changes together with regular taking of diabetes medications. If this is not enough, try another natural alternative. Click here to learn more. Please follow this link to get your full answer. QUERY: Believe it or not, going 23 years, I have been getting high blood sugar readings 4x/day, after each meal and when I wake up in the morning, and they have yet to do damage to my health. So, what am I saying? I don't worry about them. Am I saying then that high blood sugar levels are not bad? No, not really. What I am actually saying is that all the high blood sugar levels I have been getting are all short-lived. On their own, they come down to normal levels. How? I don't know because I am not an expert on this. Why are they short-lived? Because my only anti-diabetes med has always been daily physical and mental activities. I have been a type 2 diabetic since July 1991. My diagnosis was based on a fasting blood sugar reading of 486 mg/dl. I have been running our stairs every day since my diagnosis. My past A1c's were between 5.2% and 6.3%. I have always been living like I have no diabetes. Still looking for a more personalized help? Get it now by our doctors by clicking here.